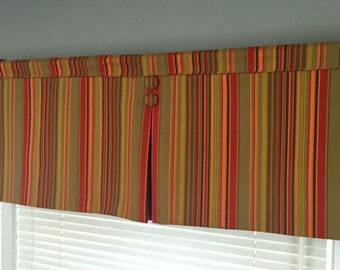 This custom box pleat valance will add charm and sophistication to any room in your home. It features one box pleat at each corner. A center pleat must be added for windows wider than 52" to hide the seam. Inside each pleat is a contrast fabric to add to the character of this window treatment. 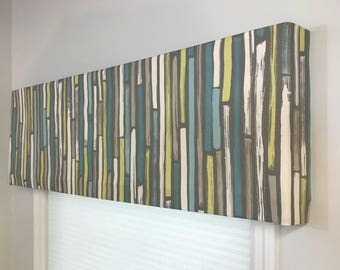 This valance is board mounted using velcro for easy installation and removal (see listing pictures). I provide the mounting board custom cut to your dimensions, the fabric lining, and the easy installation instructions with your purchase. 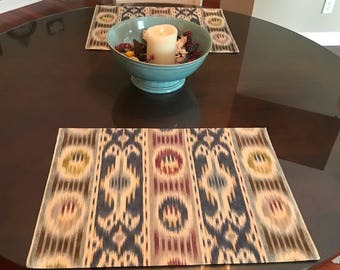 You may choose to have the coordinating fabric remain completely inside the pleat like the flower valance from the gallery or have it extend an inch outside the pleat to create the look of a trim stripe like the coral/orange ikat valance from the gallery. I am open to creative ideas to help you create a custom window treatment for your home. 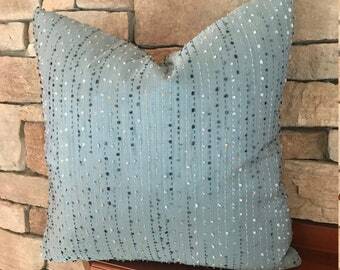 I do not stock fabrics for you to choose from, but I am more than happy to provide fabric sources if you need help or inspiration. 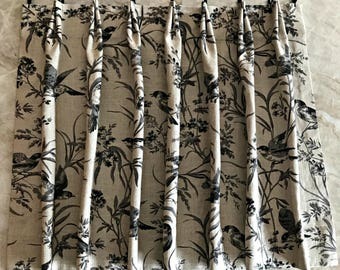 This valance requires a yard or two of a 54" medium weight home decor fabric. 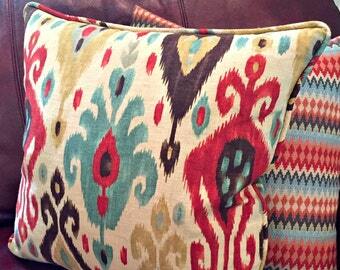 Yardage is largely dependent on the size of your valance and the size of the fabric print. I will confirm yardage with you. 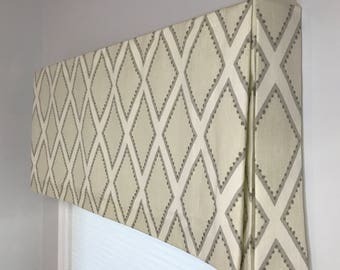 Pricing given is for a single valance up to 48" wide x 16" tall. I will advise if the fabric pattern size lends itself to a different length. Extra length can also be added upon request. Please note that wider valances will have a pleat in the center to hide the seam. Mounting board is 3.5" in depth. Board depth can also be adjusted if needed. Message me for pricing over 48" wide. Step 1- Send me a message by clicking the "request a custom order" button at the top of the listing page. A) Window measurement specifying window width. This measurement should include window trim or molding. 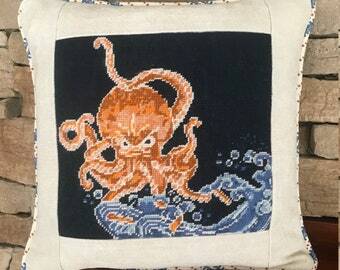 Step 3- I will reply to your message with a cost estimate for your project and fabric yardage needed. If you choose to accept your estimate, I will write up a custom listing for you to purchase. *Please note that due to the varied installation applications, I do not provide mounting hardware. This valance uses simple L brackets that can be purchased at any home improvement store. This project was handled with total professionalism from the beginning conversation to the delivery of my valance order. 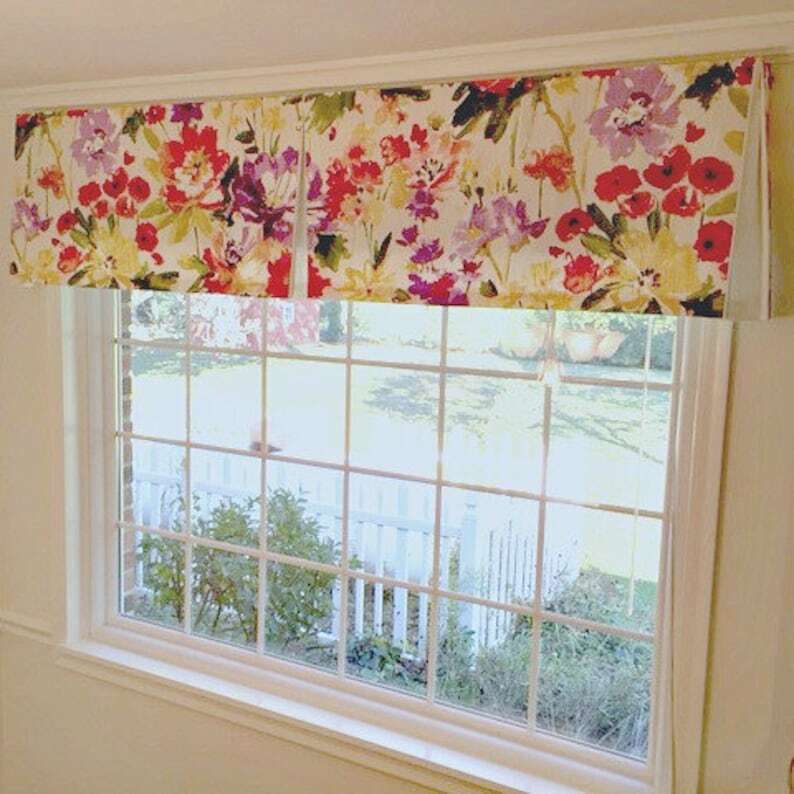 Ahna provided experienced guidance on the best proportions for the valance. I received instructions on how to install. The workmanship on the valance itself is top notch. It is a major statement piece in my stain. Ahna met all my expectations and more!! I could not be happier! Our window treatment turned out amazing! The attention to detail and overall quality is impressive! Thank you! Thank you! Thank you! We will be using you again soon! Super helpful. Cares about solving her clients needs. This is my 2nd order for a valance and pillow covers with Ahna. It turned out as beautiful as the 1st order. Ahna asks important questions so that she can deliver a quality product and she really delivers. Her work is beautifully done and the business part is handled professionally. I highly recommend Ahna.....you'll be thrilled with her work. Please submit payment within 48 hours if you receive a link to a custom order. If payment is not made during this time frame, I reserve the right to cancel the order. Your order is placed in my queue only when the purchase has been made. Returns are not accepted. However, customer satisfaction is my number one priority. If you are unhappy with your purchase in any way, please contact me within 7 days of receipt. I will do my best to rectify the issue as soon as possible. Buyer is responsible for return shipping cost if applicable. I cannot be held responsible for fabric defects or poor quality fabric. Please inspect fabric prior to shipping it to me if you are concerned about this possibility. I strive to complete and ship each order within three business days from purchase for in stock items. Custom orders may take longer, so an estimated ship date will be communicated to the customer when the order is placed. Expedited shipping is available upon request for an extra charge. Custom orders and/or product suggestions are always welcome. If you don't see something you'd like me to make, feel free to ask me about it. What kind of fabric should I look for? 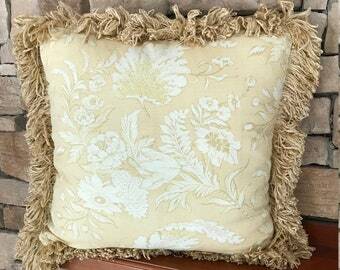 You should look for a 54" wide home decor fabric in a light to medium weight.